The specimens shown at right are from India. 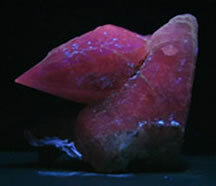 The fluorescing red crystal specimens are ruby. The matrix is zoisite The red corundum will fluoresce under short wave ultraviolet light, but is more of a dull cherry red. Due to the weakness of the fluorescence, we passed on the short wave image for web site purposes. The third row of minerals is apophylite and selenite from Maharashtra, India. The fluorescence of this specimen is minimal (only a small amount at the top of the specimen). 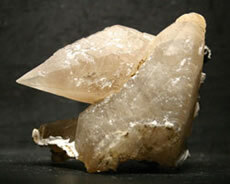 The large blocky crystals are apophylite and the thin blades are selenite. 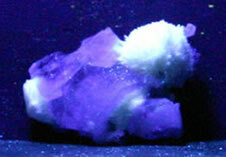 The blue to purple color showing is the reflection of the short and long wave ultraviolet lights off the light colored specimen. 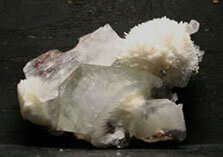 The fourth row of minerals is apophylite and scolecite from Jalgaon, Maharashtra, India. The white fluorescing scolecite is a nice cluster of fine needles. 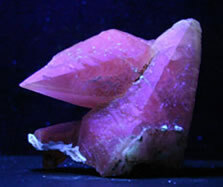 The blocky crystals are non-fluorescing apophylite. 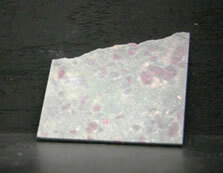 The purple color shown here is the ultraviolet lighting reflecting off the clear to light colored crystals. The fifth row of minerals is stilbite and okinite (with some thompsonite?) from Maharashtra, India. You can see from the images here, that most of these minerals fluoresce under both long and short wave ultraviolet lighting. But, they fluoresce best under both at the same time. 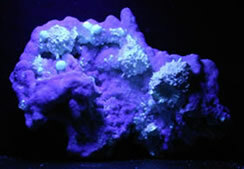 The blue and purple colors present in the photos are the reflection of the lighting off the light colored non-fluorescing parts of the specimen. Row six is a nice specimen of stilbite and thompsonite. The specimen comes from Maharashtra, India. 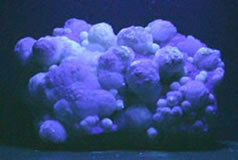 The white fluorescing mineral is thompsonite. 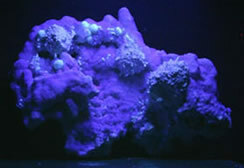 The blue to purple showing on the specimen is the lights reflecting off the non-fluorescing light colored stilbite crystals. Row seven is a strange specimen. 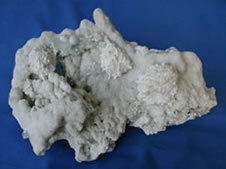 It seems to be made up of apophylite, stilbite, scolecite and a couple of other minerals. This specimen is also from Maharashtra, India. 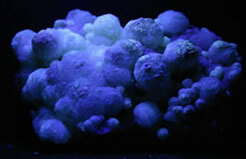 The scolecite is the white fluorescing mineral showing on the specimen. 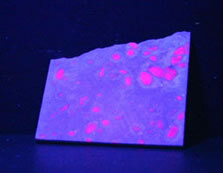 The purple is the reflection of the ultraviolet lighting off the light colored non-fluorescing minerals of the specimen. 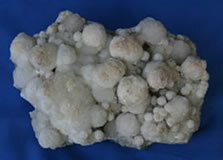 Row eight photos are of a nice large calcite specimen from Nasik, India. The long wave image is brighter, but the short wave ultraviolet lighting brings out a richer red. Normal lighting gives the specimen a clear to milky white color.